I’ve been talking to the folks at Choice of Games over the past few weeks, and it looks like they’re in favour of releasing HMS Foraker as an ad-supported title on their main catalogue. What does this mean? First of all, it means HMS Foraker will be getting a general release as a free-to-play title (with in-app purchases to remove ads). More importantly to me this also means that the little side-project that I’d more or less started on a whim will be an official part of the world, and “Choice of Broadsides canon”, which is something I’m pretty proud of. Choice of Broadsides was the first CoG IF I ever played way back in 2011, and it’s what got me thinking about the potential of interactive fiction in the first place, so to have my own writing considered good enough to add to its continuity is a bit of an honour. I’m looking forward to seeing this one released. Even though it’s only a fraction of the size of some of my other titles, it’s still got a few new and interesting mechanics I’ve been wanting to test out, along with some of my most polished writing and design work yet. In other news, new installments of A Soldier’s Guide to the Infinite Sea and An Adventurer’s Guide to the Fledgling Realms are up. As usual, my worldbuilding articles are funded by my Patreon supporters. If you want to see more of this sort of stuff, you can donate to my Patreon here. As some of you may know, I’ve been spending much of my time these past few weeks planning out the basic structure of Lords of Infinity. At this point, the basic shape of the first half of the story has more or less solidified. Today I’d like to share with you how this part of Lords of Infinity might play out. The Dragoon Officer is now a Lord of the Cortes. As a peer of the realm, the Dragoon Officer now serves as a member of the Cortes, the legislative body of the Unified Kingdom’s royal government. As such, he now holds a significant amount of influence over the way the Unified Kingdom deals with the political fallout of the Dozen Years’ War, and how it makes sense of its new position in the Infinite Sea. The Dragoon Officer is now a Landed Aristocrat. As a Baron of the Unified Kingdom, the Dragoon Officer now has his own fief to maintain, grounds to upkeep, and tenants to placate or antagonise. While the Barony provides an income, its infrastructure is decrepit, and the family manor itself is in a state of extreme disrepair. The plundered wealth that the Dragoon Officer might have brought back from Antar might be enough to restore the Barony to level of profitability and improve the lives of those who live upon it, if spent wisely. These two developments have a lot of common themes. Both deal with the aftermath of the Dozen Years’ War on a personal and a national level. Both delve deeper into the structures and relationships which underpin Tierran society, and they both examine the responsibilities and powers of a member of the Tierran aristocracy. However, the focal points of these two different plot threads are far separate from each other, both in senses of tone and geography. As a result, I’ve made the decision to split the first half of Lords of Infinity into two separate plot threads. After the prologue (when the Dragoon Officer is introduced to his duties as a Lord of the Cortes) and the first chapter (when he returns to his ancestral estate for the first time in over a decade), the player will have a choice to remain on the estate, or to establish himself in Aetoria, the Tierran capital. In the former case, the player will have a lot more opportunity to develop the Dragoon Officer’s personal holdings, and build a relationship with the tenants living on his land. In the latter case, a presence in the Capital means more opportunities to get involved not only with Cortes politics, but to wield influence in the circles of power, making influential friends and enemies within the various factions quietly struggling over the soul of a Unified Kingdom on the brink of momentous change. Both options will have their advantages and disadvantages. Some characters will be easier to find and interact with in the city than in the country, and vice-versa. A Dragoon Officer who remains on his estate would be able to build relationships with his neighbours and tenants, refurbish his manor, or work to make his fief more economically viable, leading to increased revenue and more influence on a local scale. Meanwhile, a Dragoon Officer who chooses the Capital could ally themselves with powerful figures like the Duke of Wulfram and Princess Isobel (the King’s younger sister), or make their experiences at war heard by joining a commission to reform the King’s Army. In either case, the decision which the player chooses at the end of chapter one can’t be undone, but it can be walked back from. At certain points, a player can choose to have the Dragoon Officer “switch paths”, either heading to the Capital with an intent to become a political player, or going home and writing off a political career as a lost cause. Doing so is a viable decision, but this too, comes with a price. As for what that price is, and what it entails, well… you’ll see. As usual, this month’s installments of A Soldier’s Guide to the Infinite Sea and An Adventurer’s Guide to the Fledgling Realms are now up and openly accessible. It’s been another busy month so far. I’ve been putting a lot of time into Burden of Command, although I suspect that the bulk of my work as a writer is almost finished. HMS Foraker‘s still moving along as well. I’ve just finished the third and last chapter, which means I’ve only got the epilogues and a few other bells and whistles to wrap up before it’s “done”. I’m considering avenues of distribution now. Assuming I find one, you might be seeing it released sometime this summer. As usual, new installments of A Soldier’s Guide to the Infinite Sea, and An Adventurer’s Guide to the Fledgling Realms are also now up. It’s been a busy month so far. Not only have I been working on the last chapter of HMS Foraker, but I’ve always been spending a lot of time and effort putting together on a particular segment of Burden of Command which took me to a lot of places I’ve never been before from a technical standpoint. Needless to say, I’m not going to spoil what exactly it is, but I can say that it’ll certainly start some conversations when players see it on release. In other news, new installments of A Soldier’s Guide to the Infinite Sea, and An Adventurer’s Guide to the Fledgling Realms are also now up. 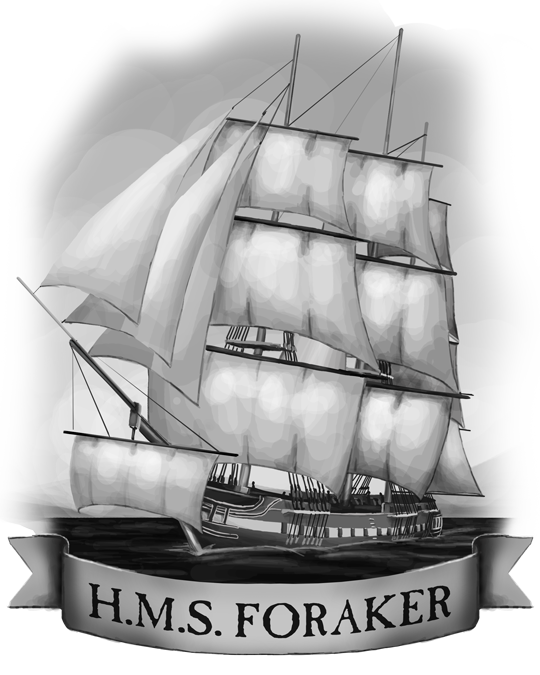 HMS Foraker is a small side-project I’ve been writing in ChoiceScript based on Choice of Games’ own Choice of Broadsides. 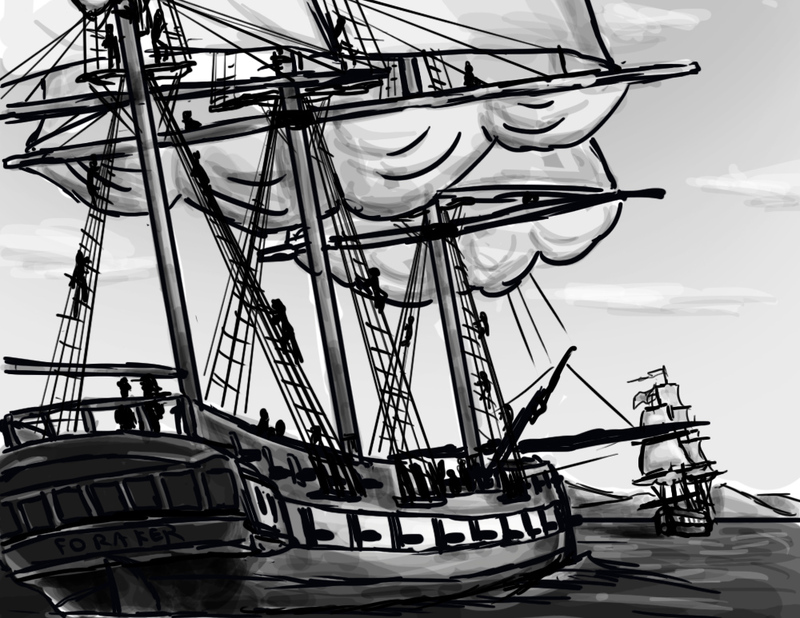 Currently about 80% done and clocking in at 65k words, HMS Foraker places you in command of a frigate and its crew in the alternate-universe equivalent of the War of 1812. Ordered to pursue a superior opponent, Foraker‘s captain must leverage the strengths of their experienced crew, veteran crew, and all the skills at their disposal if they mean to secure victory. HMS Foraker is, for all accounts and purposes, fanfiction, which means it probably won’t get a commercial release (though I am seeing if there’s a way to get some kind of widespread release in future). I’m mostly writing it in my off-time to get myself back in the right mindset for Lords of Infinity after working for so long on Cryptkeepers of Hallowford and Burden of Command. It’s also giving me some space to experiment with a few new gameplay mechanics which might make an appearance in certain sections of Lords of Infinity. Here’s a link to the discussion thread on the CoG forums, for anyone who wants to know more. As usual, new installments of A Soldier’s Guide to the Infinite Sea, and An Adventurer’s Guide to the Fledgling Realms are now also up. 3 Comments	| tags: Guns of Infinity, HMS Foraker, Interactive Fiction, Patreon, Sabres of Infinity, the cryptkeeepers of hallowford, The Hero of Kendrickstone, Update	| posted in Interactive Fiction, Misc. So, I’ve got a few more minor housekeeping updates this month, just to keep everyone appraised. First of all, we’re very nearly finished the primary writing work for Burden of Command, and the main campaign is only a few steps away from being completed. While this still means we’ll have a few months of scripting, polishing, proofreading, and other supplementary writing to do, it does mean we’re in the home stretch. In addition, I’ve been working on a little side project (I’ll announce that in a week or two), both to unwind a bit from finishing up Hallowford, and to help transition in writing from Burden of Command‘s earthier, more direct style to something fit for a project with a more circumspect and courtly tone. Long story short, I’m getting ready to start on the primary writing phase of Lords of Infinity. In addition, new installments of A Soldier’s Guide to the Infinite Sea, and An Adventurer’s Guide to the Fledgling Realms are now up. 3 Comments	| tags: Interactive Fiction, News, Patreon, Update	| posted in Burden of Command, Interactive Fiction, Misc. Those of you who check the Patreon Content page today may find a new addition. As promised, exceeding $300 a month in patron pledges means I will be writing not one, but two monthly worldbuilding columns. In addition to the regular Soldier’s Guide to the Infinite Sea, I’ll also writing monthly installments of An Adventurer’s Guide to the Fledgling Realms, articles about the setting of The Hero of Kendrickstone and The Cryptkeepers of Hallowford. If you have any interest in supporting more of this sort of worldbuilding work, consider backing my Patreon. Topics for these columns are suggested by and voted on by patrons at the $10 a month and $2 a month tiers respectively. In addition, $1 a month backers get access a week in advance.